The MEB is designed to provide mission command of forces from multiple branches, but especially those that conduct support area and maneuver support operations for the force. It employs them to conduct decisive action in support of Army division; EAD; and joint, interagency, or multinational headquarters. More than one MEB may be assigned to a higher headquarters. The critical missions or key tasks of MEBs include maneuver support, consequence management, stability, and support area operations. A common thread among each of these missions is the obvious capability requirements of the MANSCEN proponents—chemical, biological, radiological and nuclear (CBRN); engineer; and military police. The MEB conducts operations to shape the operational environment and mitigate its effects on friendly operations. 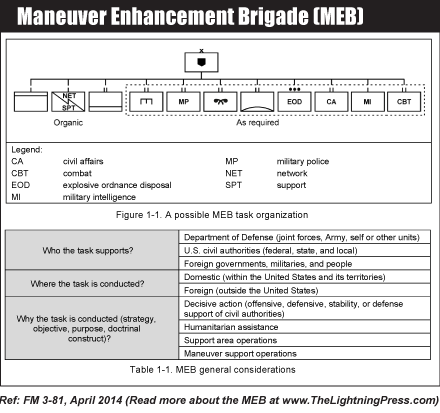 The MEB can simultaneously support (complement or reinforce) offense, defense, stability, and DSCA in support of a higher echelon or focus on a single task during a phase of a larger operation or within a specific. The capability to synchronize support area operations and maneuver support operations under the MEB has the capabilities to synchronize to other Army, joint, and multinational elements. The MEB can enable the decisive operation or lead shaping or sustaining operations with a focus on general engineering. In special situations, the MEB may conduct the decisive operation. The MEB is not a maneuver brigade; however, it is normally assigned an AO and controls terrain. This capability makes the MEB the best organization in the Army to perform support area operations for the division and corps. The MEB capability to conduct support area operations in the assigned echelon support area provides added security and defense for other units and enhances the freedom of mobility for the supported echelon. • Conduct Support Area Operations, including terrain management, information collection, CA operations, air and ground movement control, clearance of fires. protection (including personnel recovery, coordination of base camp/base cluster defense, and response force operations), liaison. operational area security. and area damage control. • Conduct Maneuver Support Operations, including mobility. protection. and sustainment. • Conduct Defense Support to Civil Authorities (DSCA), including support to domestic disasters, domestic CBRN incidents, domestic civilian law enforcement agencies, and other support as required. • Conduct Stability, including civil security (including security force assistance), and civil control, essential services restoration. governance support, and economic and infrastructure development support. For discussion of Support Area Operations and Maneuver Support Operations, see “SMFLS4: Sustainment & Multifunctional Logistics SMARTbook, 4th Ed. (Guide to Logistics, Personnel Services & Health Services Support)“. In addition to ADP/ADRP 4-0 Sustainment (Jul ‘12), SMFLS4 incorporates the full scope of new material from ATP 4-94 Theater Sustainment Command (Jun ‘13), ATP 4-93 Sustainment Brigade (Aug ‘13), ATP 4-90 Brigade Support Battalion (Aug ‘14), Sustainment Planning, JP 4-0 Joint Logistics (Oct ‘13), ATP 3-35 Army Deployment and Redeployment (Mar ‘15), and more than a dozen new/updated Army sustainment references to include ATP 4-33, ATP 4-42, ATP 4-16, ATP 4-0.1, ATP 4-34.40, ATP 4-92, FM 1-0, FM 1-04, FM 1-05, FM 1-06, FM 4-01, FM 4-02, and FM 4-30. For discussion of Defense Support of Civil Authorities (DSCA), see “HDS1: The Homeland Defense & DSCA SMARTbook (Protecting the Homeland / Defense Support to Civil Authority)“. Topics and references include homeland defense (JP 3-28), defense support of civil authorities (JP 3-28), Army support of civil authorities (ADRP 3-28), multi-service DSCA TTPs (ATP 3-28.1/MCWP 3-36.2), DSCA liaison officer toolkit (GTA 90-01-020), key legal and policy documents, and specific hazard and planning guidance: wildland fires, wind storms, earthquakes & tsunamis, floods, winter storms, chemical biological radiation nuclear (CBRN) events, and national special security events (NSSE), plus more. For discussion of protection, domestic disasters, domestic CBRN incidents, and consequence management (CM), see “CTS1: The Counterterrorism, WMD & Hybrid Threat SMARTbook (Guide to Terrorism, Hybrid & Emerging Threats)“. Topics and chapters include: the terrorist threat (characteristics, goals & objectives, organization, state-sponsored, international, and domestic), hybrid and future threats (forces, organization, operations & tactics), forms of terrorism (tactics, techniques, & procedures), counterterrorism, critical infrastructure (identifying weaknesses, risk management, and cyber threats), protection (warfighting function, supporting tasks, and planning), countering WMD (WMD weapons, planning, and execution), and consequence management (all hazards response, domestic, international and DoD-led CM). For discussion of Stability Operations, see “TAA2: The Military Engagement, Security Cooperation & Stability SMARTbook, 2nd Ed.“. Topics and references include the Range of Military Operations (JP 3-0); Train, Advise & Assist (SFA/FID/IDAD/HN/FSF); Stability Operations (JP & ADRP 3-07); Peace Operations (JP & FM 3-07.3); Counterinsurgency Operations (JP & FM 3-24); Civil-Military Operations (JP 3-57); Multinational Operations (JP 3-16); and Interorganizational Coordination (JP 3-08).